A polyhedron that fills allspace. Rossiter wrote: The mid-point of twisting between a cuboctahedron and rhombic dodecahedron. The cords form a shape close to a small rhombicuboctahedron. 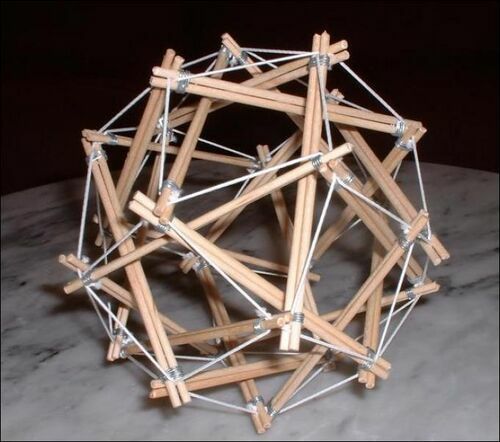 It has the 14 faces of the cuboctahedron (6 squares and 8 triangles) and the 12 rhombi of the rhombic dodecahedron. The struts are arranged as 6 squares, arranged in parallel pairs offset by an 1/8 of a turn. This page was last edited on 20 January 2019, at 12:46.